Posted on June 16, 2016, in Michael Jackson and tagged Birth of a Nation, Dalai Lama, Eleanor Bowman, Elizabeth Taylor, Forest Lawn, Great Mausoleum, Holly Terrace, Hubert Eaton, Michael Jackson, Walt Disney. Bookmark the permalink. 22 Comments. Willa, Lisha, Eleanor: Thanks so much from the heart for this article. 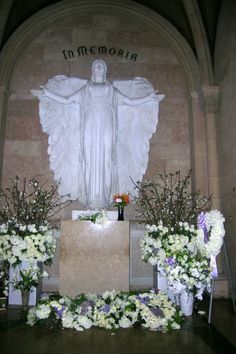 I was sitting here just this evening thinking that the anniversary of Michael’s death is only ten days away and unlike the previous six years, I haven’t made any plans to honor him (other than adding my roses to the wonderful annual display). That isn’t sitting well. 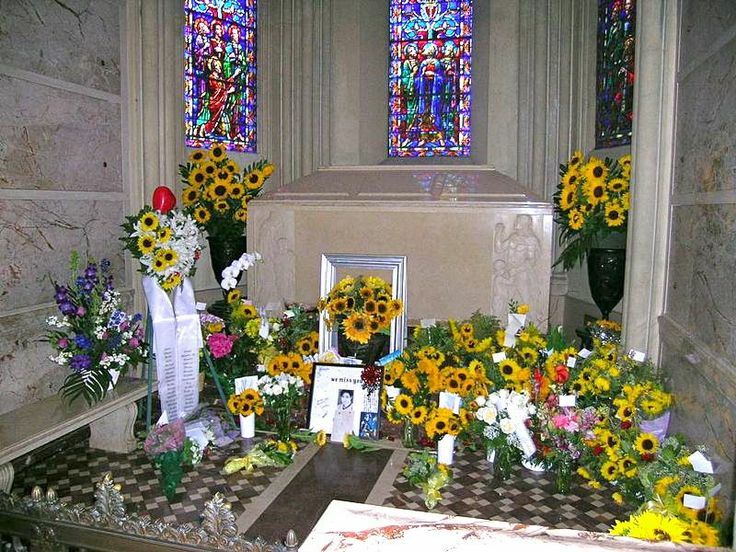 I’ve made many trips to Forest Lawn, including the first anniversary in 2010 when the city of Glendale, totally freaked out by what they expected to be an onslaught of thousands of frantic and frenetic MJ fans, closed all the streets in the area of the cemetery and prevented anyone from parking anywhere in the vicinity. Police and security were everywhere. Media and law enforcement helicopters buzzed around overhead. I walked almost two miles from my hotel in Atwater on that very warm day to get there, carrying a bucket of two dozen Freedom roses I’d brought with me from Northern California. To get into (or back out of) the grounds, visitors were forced to run the impressive gauntlet of massive media presence on the side street near the gates, all of whom were begging for interviews and fan reactions. I think there were more media than fans for at least some portion of the day. Once inside the gates it was a long uphill walk to the mausoleum, and crowd control was definitely in force. One of the first things I glimpsed was a long line of black limos and SUVs parked outside the downslope side of Holly Terrace, where I eventually found out Michael’s tomb actually was located. The Jackson family was having a special service inside that morning. That sight brought some reality to the unreality of his death. The day was really saved, though, by the unique experience of seeing the fans who came that first year. So many countries were represented, so many conversations going on in so many languages… So many skin colors united by one man who refused to spend his life being a color. I loved it. My overriding impression of the mausoleum has always been that it is way too cold and sterile for such a warm and colorful individual. And way too quiet for a man who lived at such an incredible volume! I’ve peeked through the Holly Terrace door a few times over the years and it seemed so very dark. The stained glass windows behind his marble box are indeed beautiful though, and give some comfort when the sun is on them. What you’ve done in this article has given me even more comfort about his final place of rest and I’m so glad you’ve elaborated on all the things that actually give Forest Lawn much more life than just a place of death. I agree that he would have enjoyed the statuary and the art, no argument there. The exclusivity of the Great Mausoleum is also a tribute of sorts I guess… But for a man who belonged so much to the world it’s yet another irony in an irony-rich life that he has to be locked away from it. But his fans do need a place they can visit to pay their respects, that’s certain. I do have a fantasy about where he should really be interred, but until some miracle brings that fantasy to reality, I feel much better now about where he is. Thank you so much for your kind words Chris. The more I thought about Forest Lawn, the more I felt like it was really a perfect place for MJ. But now you’ve got me curious about your “fantasy about where he should really be interred!” I would love it to hear more! That’s interesting what you said about the “exclusivity of the Great Mausoleum.” It is a really grand place – very expensive – yet ordinary tourists and fans are allowed to gather there in the designated places. MJ had so many moves like that, as Eleanor pointed out, about the mixing of “high” and “low” art. What comes to mind for me is the exquisite hand beaded jackets he wore, which must have cost tens of thousands of dollars, but he paired it with ordinary Levi 501 jeans and Florsheim shoes. Forest Lawn seems that way to me, exclusive, yet a place the public is welcome to enter and enjoy. I edited the article and re-titled it. Lol! I always do my best editing *after* I hit publish! This is so wonderful Chris. Love the article and the idea! Should we also include some sort of June 13th celebration where the whole world apologizes and makes everything right? Some kind of ritual healing? It’s the paradise MJ always imagined was possible. 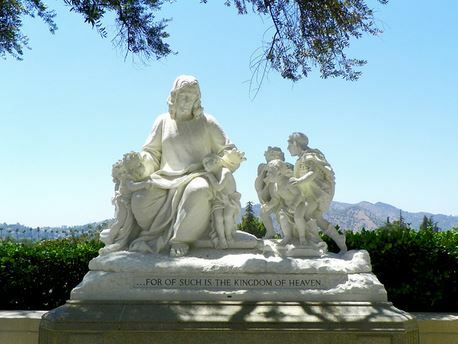 Hi Chris — Thanks so much for your sharing your memories of your 2010 visit to Forest Lawn. So interesting. I had no idea. I am feeling very sad, as the anniversary of his death approaches and wish I could do something. I wanted to go back on the date of the anniversary this year, just to be with other fans, but it doesn’t look like a trip to California is possible. Maybe next year. I have a fantasy of the Dancing With the Elephant community coming together some day to honor Michael at Forest Lawn. Dear Willa, Lisha and Eleanor, it is with much gratitude I express my thanks for your article. It truly gives life to Forest Lawn filled with your insights, history and highlights of the exterior and interior. It has been mainly a place of mystery to me, this place of Michael’s tomb. I have no doubt that Michael approves. Each year I look forward for the amazing display of red roses for the anniversary of his leaving us. That is such a lovely and loving display each year thanks to One Rose For Michael. Thank you so much, Gloria. I really appreciate your thoughtfulness. And I really agree with you, the roses are such a beautiful and loving gesture. How I would love to visit someday and see them for myself on June 25th! I’m glad you enjoyed it, Gloria. It was fun to find so many connections and associations. And, thanks for reminding me of One Rose for Michael. Even tho’ I can’t go back, at least I can do that this year. Dear Willa. This has been the best so far of your ‘Dancing with the Elephant’ series, and also many thanks to Lisha and Eleanor for their input. I have sent seven roses this year, one for each year since 2009,and to represent each/some of Michael’s talents. I would love some day to visit. But I have one question, perhaps a delicate one, that I have asked several times and never had a satisfactory answer. Why is Michael’s name not engraved on his tomb? Others, like Elizabeth Taylor have theirs. It puzzles me a lot, and leaves room for speculation. Thank you. I’m not sure at all about the engraving on the tomb at all. I haven’t seen it myself so I don’t know if the family chose to make it very discreet, or if they preferred for it to be left off. You’re right, that does leave room for speculation. I’m wonder if someone else knows the answer to that. Thanks for your comment, Nina. I can’t answer your question, however. As I never got inside the mausoleum, I didn’t know his name was not engraved. A mystery. Eleanor: an Internet search on the subject of MJ’s tomb being “unmarked” turns up some controversy on that subject. Some articles say that is so, but some say there is an engraved plaque that can be seen in some (unauthorized of course) photos of his tomb that have been leaked at various times. Logically, the reason for anonymity would certainly be the threat of vandalism if the security measures put in place by Forest Lawn were somehow to be breached. As my friend Theresa said early on: the only person who can answer for the choice to keep it unnamed, IF that is true, is Katherine Jackson. My search also turned up an interesting fact: another Jackson is apparently buried there already. A UK newspaper showed images from May 1990 of Michael apparently attending the funeral of his “much-loved grandmother Martha Bridges” at Forest Lawn. 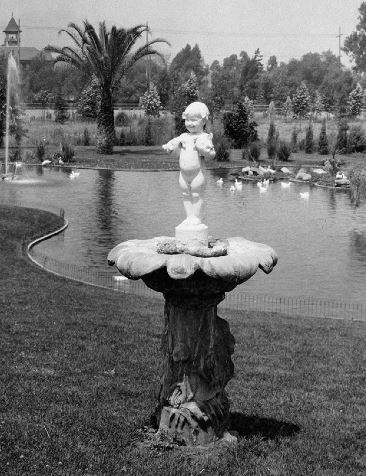 From the photo, I infer that she was buried rather than interred, somewhere in the park’s rolling hills. Might be fun to locate her resting place too. Caveat: this newspaper is not known for unbiased reliability or factual reporting. 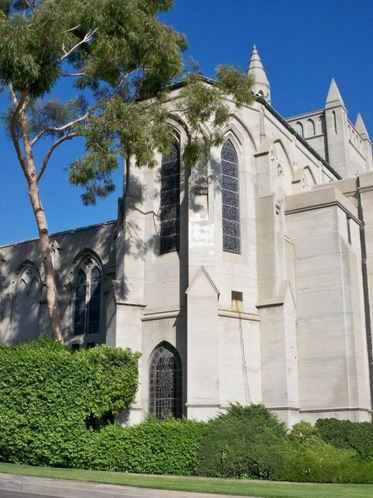 Michael Jackson’s crypt was still unmarked last November, which is curious and something I’ve wondered about also. I don’t think it’s for security reasons, since his crypt is surrounded by flowers for him and notes written to him. So it’s pretty obvious who’s interred there, even without a name on the crypt. I wonder if the family is simply having a hard time coming to consensus on what to write. There may be some debate about whether to include just his name, or his name and a quotation, or … Once the words are literally “carved in stone” into the front of his crypt, you can’t change them, and he has a large family with a lot of different opinions and viewpoints. I can see how this would be a very emotional issue, and could take quite a bit of time to decide. Reaching resolution on decisions like that can be part of the grieving process sometimes, and that may be part of it also. Thank you for the clarification on Grandmother Jackson’s whereabouts, Willa. Typical of many newspapers in the UK, no surprise there, who don’t get their facts straight where Michael is concerned. And really… does the most widely-recognized man ever to live on Planet Earth really need an inscription? I wonder. Hi everyone. Sorry to come to the party late as well – have also been away. I very much enjoyed this blog, and as usual, learned a whole lot more new facts. It is very unlikely that I will ever visit US so am glad to know more about Michael’s resting place. Hard to believe that it has been seven years already. I had no idea that his tomb is ‘unmarked’. Does seem a bit odd, but I do feel that it needs to have his name on it for future generations and the sake of HiStory. I really believe that cemeteries do not have to be places of doom and gloom, but beautiful places that celebrate the lives of the people interred there. Am sure that Michael would have loved the sculpture and the whole vibe of the place. 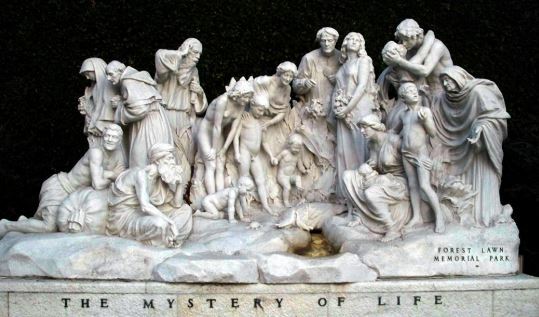 There is a cemetery in the suburb of Staglieno in Genoa Italy started in 1851 (never visited but have a dvd about it) that is full of beautiful tombs with amazing sculpture and statues in celebration of the people interred there. Obviously most of the tombs were provided for the wealthy and middle class, but there is a tomb with a beautiful statue of a woman who was a hawker of bread and nuts at the local fair, who saved all her life for her memorial. 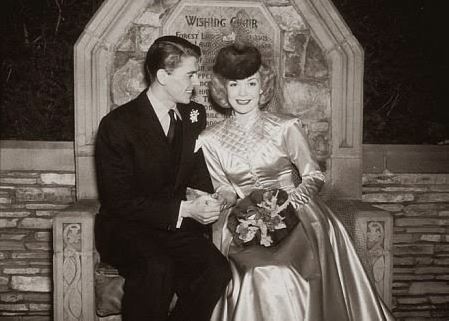 Love the idea of the chapel at Forest Lawn being used for weddings as well. Sounds a very special place altogether, and am very glad to know more about it, and get a feel for it. Hi Caro. I agree, and it’s a much nicer way to think about cemeteries, isn’t it? I remember visiting a church in Vienna, I think it was, a long time ago. It had a cemetery beside it, and each of the cemetery plots was like a small flower garden, each one a little different. It was beautiful. Family members would come regularly to tend the tiny “gardens” and think about their loved ones, and I thought it was such a lovely idea. Like you, I really like the thought that Michael Jackson is in a place that celebrates life, and a place that makes us rethink our ideas about cemeteries and death itself. It seems appropriate for someone who was so fully alive, and whose art led us to rethink so many things, such as our ideas about race, family, age, religion … so many things. By the way, here’s a post by hannahkozak with photos from this year’s memorial gathering at Forest Lawn.